The Chicago Teachers Union House of Delegates voted unanimously to reject a contract negotiations fact finding report issued by Independent Fact Finder Edwin Benn. While the report proposed a fair salary increase for teachers, delegates voted against the report at the special meeting on July 18 because it didn't recommend any changes in the contract to permit recall rights for displaced or honorably discharged teachers, it didn't recommend fair salary increases for non-teaching staff, and it didn't address class size issues. 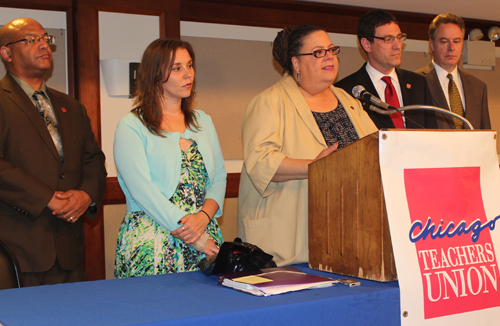 Chicago Teachers Union President Karen Lewis (with Recording Secretary Michael Brunson, Financial Secretary Kristine Mayle, Vice President Jesse Sharkey, and CTU Attorney Robert Bloch) announces to the press that the CTU House of Delegates rejected the independent fact finding report. She thanked Benn for recognizing that the Board was substantially lengthening the school day and year "with the expectation that the employees will work those additional hours (approximately 20% more) for free or without fair compensation for the additional work. The employees will not do that and should not be expected to do that.” However, Benn's report did not adequately address union concerns about class size, a better day, and job security, and for these reasons the CTU rejects the report, Lewis said. Substance photo, Sharon Schmidt.CTU President Karen Lewis addressed the press following the House of Delegate's meeting. Her prepared remarks follow. Following that, some press questions and Lewis answer. Thank you. I’d like to introduce Chicago Teachers Union Vice President Jesse Sharkey, Recording Secretary Michael Brunson, Financial Secretary Kristine Mayle, and CTU Attorney Robert Bloch. Today the Chicago Teachers Union House of Delegates reviewed the details of a contract negotiations fact finding report issued by Independent Fact Finder Edwin Benn. After consideration of the merits of his report the House of Delegates voted unanimously to reject it. The need for not merely a longer school day, BUT a BETTER DAY which offers students a world class education. We must make it a priority to deliver to every student in every classroom a rich curriculum that includes art, music, foreign language, and physical education. In taking today’s vote our delegates – who represent teachers, clinicians, and PSRP’s that work in over 600 school sites – gave their full support to our Union’s negotiating team which even this morning maintained a “good faith bargaining attitude” during a long negotiating session with the Chicago Board of Education. As for our next steps, we are committed to continuing to talk with and inform the school board negotiators about our work in Chicago’s classrooms. We are committed to working to achieve a labor contract that truly serves the needs of all Chicago public school students. Thank you. 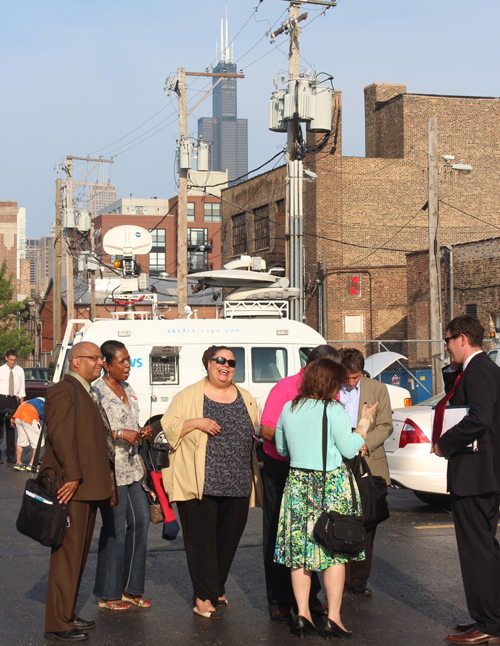 Following the prepared remarks, Karen Lewis fielded questions. “We have some solutions [on a longer / better day] and we would like to negotiate that way instead of the Board saying we have some arbitrary number and we’re doing it this way. That’s an issue.
" This morning. I mean there has been an average of three meetings a week. We have never left. I wish you all wouldn’t say 'back to the table.' We never left the table. We never believed the fact finder report was going to be what they claimed it to be. “Of course that’s what they’ll say. They wanted the fact finder to do what they wanted him to do. An independent arbitrator looks at everything. Including this toxic relationship which they started. “I’ve noticed a change in the tone since May 23. When you bring 10,000 people in the street, people have a new way of looking at you., There was a change since the Strike Authorization Vote It’s time to reset this relationship. We have always said we want a better relationship." Question about the House of Delegate’s vote to reject the fact finder’s report. CTU House of Delegates Rejects Proposals! Due to the passage of Senate Bill 7, the so-called "Education Reform" bill that mainly changed collective bargaining procedures, CTU and CPS have to follow a set of procedures if the two sides hit impasse over negotiations. The "Fact-Finding" period has ended and the two sides, along with the neutral Fact-Finder Edwin H. Benn have issued their statements. Chicago Board of Education has issued their dissent, and after an emergency meeting of the Chicago Teachers Union's House of Delegates, CTU has decided to reject Arbitrator Benn’s proposals. The fact-finding process was written into statute by SB 7, a “collaboration” which began with the threat of completely removing collective bargaining rights for teachers in Illinois. The fact that everyone accepted the final bill owed to the following deal for Chicago: the district was allowed to impose a longer day and year, and the union preserved the right to strike, provided we reached 75% strike authorization. Of course, this is the first time Chicago has negotiated a contract under the new strictures, and there has been much gnashing and crying (The union has voted too early! The fact finder must take ‘fiscal reality into account! Etc!) which amounts to this: some of the champions of this new law had clearly hoped that it would simply allow them to impose their will—and do away with the tiresome business of negotiating in good faith with the people who actually make the schools work. But reality has a nasty habit of interfering with plans—the teachers, PSRP’s and clinicians of the Chicago Public Schools have rallied, voted, and otherwise proven that we will have a say in what happens to our schools. Now we arrive at this report—a look at the issues by an experienced labor arbitrator—a neutral party—who has the power to tell us what we don’t want to hear, but only if we listen. If that were the sum total of the issues on the table the Union could accept the report, remind the Board that in early June CEO Brizard wrote, “teachers deserve a raise and will receive one that is fair. How much that raise should be is in the hands of an independent fact finder” and move on. But the question of compensation—however important—does not trump our concerns about class size, a better day, and job security. Ultimately, the fact finding process will leave these and other many unsettled issues for the bargaining table, but will serve a useful role if it helps to encourage both parties to move from their currently held positions. I respectfully dissent. The Union proposed a 2-year agreement and cannot accept Fact-Finder Chairman Edwin Benn’s proposed 4-year agreement, despite his recommendation that wages and benefits can be reopened in the third and fourth years. Though Mr. Benn recommended a re-opener of health insurance and wage issues at the request of either party for the third and fourth years of the proposed agreement, he recommends that any dispute be submitted to binding arbitration, and the Union could not agree to defer these important issues to arbitration. It would prefer to negotiate its own agreed solution. I concur, for all salaried employees including teachers, clinicians, and PSRP’s listed in Appendix A and subject to the two-year limit on duration. 3. Health Insurance. I respectfully dissent. I cannot agree that the entire burden of increased health care costs be placed on families. Also, I cannot agree to an increase in Emergency Room co-pays without conditions. Many CPS staff use emergency rooms for after-hours medical care because of the scarcity of night and weekend urgent care facilities in Chicago, and because the demands of teaching make it difficult to schedule medical appointments during office hours. This problem must be addressed as part of the health insurance package. Finally, the Union has proposed that the parties establish a meaningful Labor-Management Cooperation Committee with authority to make agreed changes in health care providers, plan design and employee cost. Without such a committee, there is no agreed mechanism for providing the highest quality health care at the lowest possible cost. I concur, for all salaried employees including teachers, clinicians, and PSRP’s listed in Appendix A.
Fact-Finder Benn proposes a first year total increase 14.85%, plus maintaining existing steps and lanes. It is very significant how he calculated it. So CPS cannot claim that Mr. Benn’s recommendation somehow overpays teachers because of raises teachers received in the past. CPS cannot claim that the last contract already paid teachers enough for next year’s wages, because Mr. Benn proposes 14.85% even after deducting the prior years’ increases that exceeded the cost of living. Notably, if wages in the 2007-12 contract were suppressed to be cost of living only, it would have significantly lowered Chicago teachers’ pay relative to other major cities. In the end, Mr. Benn is saying that even if teachers only received cost of living increases from 2007 through the end of the next contract, they should still be paid 14.85% this coming year. In the end, though the Union concurs with the total amount of wage increases recommended by Mr. Benn, its reasons are not the same. The Union’s position on a salary increase is based on the undeniable facts that a promised salary increase was revoked, that educators at CPS will be working much harder, must grapple with enormous changes to be imposed in curriculum and teacher evaluation, and are already working close to 60 hours per week, as documented in a 2012 University of Illinois study. Without delineating all of the factors individually and in detail, the Union nevertheless concurs that the pay recommendation in Mr. Benn’s report would settle the issue of a raise, including the 2.25% for the second year. 5. Sick leave and short-term disability leave. I respectfully dissent. Fact-Finder Benn declines to take sufficiently into account that compensation for unused sick days has been negotiated over decades into the labor contract, in exchange for wage increases. His adoption of a use-it-or-lose-it proposal on unused sick leave is unnecessarily restrictive. The Union has proposed that employees be compensated for unused sick leave. I respectfully dissent. CPS in recent years has laid off thousands of teachers for reasons that have nothing to do with teaching abilities or job performance, but rather to balance its budget or to close schools. Unlike almost any other employees with collective bargaining rights, these teachers currently have no right to be recalled to employment. They are fired – CPS’s term for it is “honorably dismissed.” If these teachers hope to find employment, they must line up like any other new applicant and are given literally no credit for their years of service. Unfortunately, these layoffs have become a fact of life in Chicago, with almost 1,300 teachers and hundreds of PSRPs laid off in 2010, hundreds more in 2011, and we expect more than a 1,000 layoffs this year. The Board’s stated policy of school closures combined with a stated goal of opening 60 more charter schools within 5 years ensures that layoffs will be a semi-permanent feature of life in the Chicago Public Schools for the foreseeable future. No union seeking to ensure the viability of public school teaching as a career could afford to ignore this issue. Mr. Benn acknowledges that “perhaps the current system is in need of repair and is not functioning well,” but he declines to recommend any changes to permit recall rights to teachers. There is no doubt that this report has the potential to help the Chicago Teachers Union and the Chicago Board of Education climb down from the high wire on which we are grappling. By offering his straightforward analysis of the Longer Day and compensation, Arbitrator Benn has injected some rationality into the discussion about what scale of reforms CPS is able afford in an era of fiscal restraint. There is no doubt that CPS will complain bitterly about this award, claiming that Mr. Benn misinterpreted the law and had no right to make such a finding. But in making this complaint, CPS runs the risk of ignoring what Arbitrator Benn calls The Realities: “This is a highly charged, volatile labor dispute with profound implications as up to 25,000 teachers and other staff and employees are poised to strike putting 400,000 children out of school.” Finally, Arbitrator Benn said that “this [fact finding] process is not a substitute for the give and take across the bargaining table.” The Union couldn’t agree more, and has every intention of working as hard as possible to negotiate a reasonable settlement to this dispute. Click here for the Chicago Board of Education response to the fact-finder report. As a member of the House of Delegates, I was very impressed by the unanimity of the membership. The fact that the recall provisions are not in place was reason enough for delegates to say "no" to the arbitrator's recognition of a big raise for the teachers. The membership stuck together for the rights of those who are most vulnerable. It was a very powerful message that was sent today. We are for one another. Two of the louder responses to the report were the disrespect shown to our PSRP's by not giving them the same increase as teachers. and the lack of any recall or job security provisions for teachers. Today The Union showed Solidarity! Under current conditions, school closings, consolidations and other actions often leave senior and highly-qualified teachers with few opportunities to move to other schools. As a result, the teachers lose their positions and the students lose the ability to benefit from the experience and talent of those teachers. The Union proposes establishment of a pool of displaced teachers from which principals must first hire for vacancies before hiring from other sources. Perhaps the current system is in need of repair and is not functioning well. However, the current system is not broken to be corrected through the impasse resolution process. Any changes to the provisions of the Agreement governing job security/reassignment and appointment must be negotiated. The Union's proposal is not recommended. Greater job security for veteran teachers has to be one of the greatest priorities for this contract. With the addition each year of more charters/AUSL schools, more and more of us will lose our neighborhood schools and find ourselves looking for a job after 20+ years with CPS. At the very minimum, the 1 year clause as a reassigned teacher must be kept, with additional language that forces CPS to make the jobs of veteran teachers a priority for the system. If we want to encourage good teachers to stay in CPS , and we want to change the 50% turnover rate of new teachers, we have to offer them some kind of protection from CPS. I am pleased that CTU House of Delegates demonstrated unselfishness for its laid off members despite all of the lies that have been spread by the CPS administration, Mayor, gullible parents and mainstream media. We, the displaced and honorably terminated are your fiercest allies. Don't kick us under the bus. A strikebreaker (sometimes derogatorily called a scab) is a person who works despite an ongoing strike. Strikebreakers are usually individuals who are not employed by the company prior to the trade union dispute, but rather hired prior to or during the strike to keep the organisation running. "Strikebreakers" may also refer to workers (union members or not) who cross picket lines to work. It has nothing to do with union membership. We are all members of the 99%. If you cross a picket line to replace those on strike, you are a scab. "Teachers, please wait for the Fact Finder..."
The 1% and their cronies changed the rules on us. Either accept those rules or surrender our ability to negotiate, was what we were told. So our leadership agreed, no other option but to, if we hoped to have SOME collective bargaining as opposed to NONE. We have to beat a 75% margin to vote for a strike. This is America, just not the America I believe it should be, and used to be. I feel it is UnAmerican, UnDemocratic, and extremely UnUsual, to force us to have to go beyond a majority rules vote, 50% plus 1. And the politicians and there BIG BUSINESS friends, who they know from their days in Washington D.C. and from the lobbyists who pave the way with lavish gifts and donations, told us that we must have a mediator/fact finder as part of the process. So we go along with that. And our CEO, Mr. Brizzard, states publicly and many times that "we should wait for the fact finder" and "that CPS will go with what the fact finder's decision. So we wait and Fact Finder, Mr. Benn, states that if we work a longer day we should be paid for it! And our Mayor's response: he "cries" like a baby on tv, whining that the fact finder is not tied to reality! SO our Mayor is calling Mr. Benn...CRAZY??? Backing off of a promise, are we? So the 1% Mega Bucks, we intend on making money off of our Charter Schools bunch, run commercials with Angela, implying that she is a teenager who wants a longer school day, when in reality she is an ACTOR who is likely to be in her thirties. And we listen to that. So they run their commercial on multiple radio stations, with multiple voice actors, in multiple languages, asks us adults to text in if we disagree with the Union's decision to authorize a strike vote. They never offer an alternative text message if you respect the teachers decision to authorize a strike vote. By not offering an alternative text, as every other media outlet does smacks, to me, of being UnAmerican, UnDemocratic, UnFair, Disrespectful, and downright DIRTY POOL! Yet they paid their money so they get to air their political add, "dressed up like a child." And yet the court of Public Opinion is still with the teachers, not the Mayor and his 1% backers! Our Mayor Rahm Emanuel was told that there was NO WAY we would ever beat these odds. He has the spin of the media. Few in the mainstream media are bold enough to confront him on the facts or when he is wrong, or when he loses. And this one, well I would not say the Mayor has won this one, would you? We want a better school day for the children we teach. We spend a lot of time with them and have a good idea about their needs. Mr. Mayor, how much time do you spend with children? You continuously use the phrase: for the children, even when it comes to speed cameras (not for Revenue, Mr. Mayor?) but how much time do you actually spend with the children you deem that you care so much about??? Our Mayor Rahm was told that the high school teachers would not be able to get the grammar school teachers on board for a strike authorization vote. Our Mayor says we need a longer school day but he can't afford to pay teachers for it. Our Mayor does not explain how that longer day will impact our kids regarding after school activities, sports, tutoring, and just plain picking up their siblings from grammar school or working after school, not to mention night school or how they will get home in the darkness of winter! SO, Mr. Mayor, a suggestion: how about you stop VERBALLY ASSAULTING TEACHERS and start treating us like the Mature, Adult, Professional, Highly Educated, Highly Experienced, and thoughtful and concerned Human Beings that we are. And Mr. Mayor, If you want to spend all the resources that you claim CPS has on charter schools, on a raise, that was for the teachers, on the police, and state that you have no more money (Hello TIF money!, where art thou? )to give to the teachers, then I suggest you hold off on your longer school day plan until you do have the money. It is a very simple solution. No one gets hurt, and perhaps one day, the public will learn the truth, which is out there, here at Substance, the Reader, Rolling Stone, and with a few other Chicago land reporters, and find out that we DO NOT HAVE the Shortest School Day in the Nation, and that we are in sync with the majority of school districts around the nation! But then we remember when you were running for the job of Mayor that you stated the charter schools performed better than the regular schools. And we remember when the students from the regular schools correctly contradicted you and stated that it is our regular schools that out perform your cherished charter schools. But we understand, you have to give back to your base, i.e., meaning YOUR DONORS! Please also remember Mr. Mayor, that teachers have friends, family, and neighbors who like and respect us, and they VOTE! To Rahm: Negotiate in Good Faith Open the Fiscal and Educational Policy Books! What do Rahm's CPS and Mitt Romney have in common? Hiding and not opening up documents to examination. The present budget and educational policies should be looked under the light of qualitative research. Bad educational policies waste money! The "Trust Me" closed book attitude by Mr. Cawley, who showed up to the budget presentation without documents, data and research to back up their stance, was totally disrespectful of people present and the City of Chicago. Rahm, open up the books if you want to even begin to come correct to the negotiations with CTU!